Calitzdorp, South Africa's Port Capital is on the Scenic Route 62, halfway between Cape Town and Port Elizabeth. It is nestled in the heart of the Klein Karoo, or Kannaland as it is better known, 50km from Oudtshoorn, 110km from George and 380km from Cape Town. Calitzdorp, overlooking a valley that spills like a "Horn of Plenty" from the Swartberg foothills, is the fruit-bowl of Kannaland and source of the country's finest port wines. If the Klein Karoo or Kannaland of old still lives on then its spirit is here, lingering perhaps in some vista of loft-doored cottages up to their cheeks in orchard bloom. For nowhere is the authentic character of a Klein Karoo community and the unique architecture of the region better preserved. In the spectacular mountains that shelter Calitzdorp on three sides, Nature too, seems unspoiled by the twentieth century. Awaiting the ecology-minded explorer is a wealth of flora, fauna and geological fascination. No wonder that so many visitors stay longer than they intended, soaking up the beauty and - why not? - a little of the wine! This fertile valley was originally inhabited by San and Khoi people who left numerous rock-paintings. Buffelsvlei, the quitrent farm on which Calitzdorp now stands, was granted in 1831 to j J. and M.C. Calitz. Ground was donated for a church in 1853 and four years later, the foundation stone was laid and a church school established. Richard van Reenen Barry was the first pastor and served the community for 40 years. In 1910 it was decided to build a new church as the congregation exceeded 4 000. 1912 was an important year as the new church and a new school building were completed, and a start made with the building of the Standard Bank as well as the Nelsrivier Dam. Subsequently drought, the Great Flu and the collapse of the ostrich feather market all hit the area hard. However, recovery followed with the opening of the railway line (1924), electrification (1937) and construction of a cement road from Oudtshoorn. The Calitzdorp of today still fits the description given by a visitor in 1857 - "this romantic and beautiful spot". Apart from the imposing Dutch Reformed Church - a National Monument in the New Byzantine style - the general architecture of Calitzdorp is strongly English-derived. Different styles have been adopted to different functions, e.g. the so-called Karoo style was used for "church houses". Simplified renderings of dominant British styles e.g. Regency, Late Georgian, Victorian and Edwardian became fashionable for more permanent dwellings. Strolling through the town is an architectural adventure. Port-grape varieties prefer a hot, dry, climate such as that of Calitzdorp. There are quite a lot of similarities between the climate of Calitzdorp and the Douro vally in Portugal. The poor, well-drained soils of Calitzdorp, where vines struggle to ripen, are very suitable for Port production. These port-wines are produced from internationally recognized port grape varieties such as Tinta Barocca and Touriga Nacional. A blend of these varieties enhances the aroma-intensity, depth and complexity of these port-wines. Last, but by no means least the dedication of the port-makers is pivotal in the production of these prizewinning ports, made in the classic tradition of a high alcohol and relatively low sugar content. Several permanent streams providing a habitat for birds that are not typical of this dry environment; Man made habitat eg. lucerne fields. Seweweekspoort: 27km tar road towards Ladismith, 17km gravel road through outstanding rock formation. Groenfontein: 50km circular gravel road passing the Nelsrivier Dam. Kruisrivier: 50km circular gravel road passing the spectacular Redstone Hills and regional architecture. 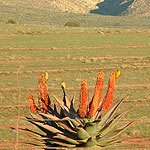 Matjiesvlei: 5km on the tar road towards Ladismith and then 16km gravel road with secluded farms amoung aloe-clad hills. Amalienstein: 27km on the tar road towards Ladismith - historical mission stations and a Lutheran church 150 years old. 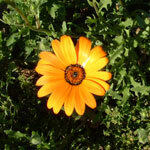 Huisrivier (West): 8km tar road towards Ladismith with breathtaking views. Rooiberg (South): 16km gravel road towards Van Wyksdorp - succulents and fynbos. Swartberg: 45km gravel road via Groenfontein / Kruisrivier and a 15km tar road with spectacular view. No caravans over this pass. Ostriches, fruit: apricots, peaches, plums and grapes, certified seed production, cattle and sheep. 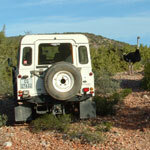 Names like Buffelsvlei and Gamkarivier ( Khoi for lion ) recall the wild animals that once roamed the Calitzdorp district. Today one of the most endangered large animals, the Cape Mountain Zebra ( fewer than 800 ) is conserved in the Gamkaberg Nature Reserve. Calitzdorp has the highest concentration in the Southern Hemisphere of the Pale Chanting Goshawk - the only polyandrous raptor. Other birdlife abounds as does a great variety of butterflies. Flowering shrubs such as Wild Pomegranade, "vygies", lye-bush, milkweed and Chinese Lantern, shelter many other smaller plants. This area is incredible rich in succulents including the Crassulas and unusual Haworthias. Although a prolific breeder and even a dominant species in some areas, the hartebeest has probably suffered the greatest reduction in range of all African ruminants.